I saw a tutorial on Dawn McVey's blog about how to make these paper flowers and I just had to give it a try. I combined Laura's Sketch 53 at 2 Sketches 4 You with the Fun With Fabric challenge at Moxie Fab World. I covered some brads with my i-top tool from Imaginisce with fabric and then I sewed the same fabric along the top and bottom of the card. Cardstock, punches, stamps: Stampin' Up! Thanks for stopping by and leaving a comment. I enjoy reading them all. I love your card!!!! Very....Very cute!!! So pretty, love those flowers! Perfectly fantabulous! LOVE, LOVE, LOVE those flowers and the color combo! great card, and i love that you repeated the fabric on the brads/ borders too! I like this card! The flowers are so adorable! Such a pretty card! Love the colors and how you used the word paper flowers and borders! nice flower !! love your card! Oh - very cool! I'm impressed you have mastered that tool - I still struggle with it! Great job! 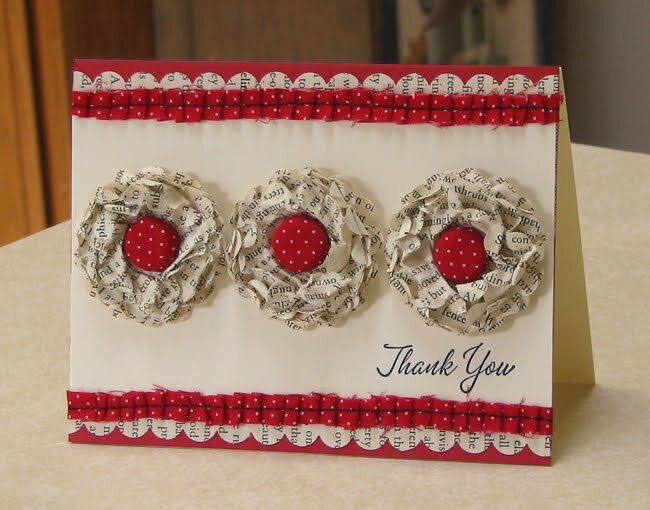 Love this card....great use of newsprint and ribbon!! Oh! I love this color combination and the general design of the card! Very pretty! Eye-catching, too! Thanks for sharing! What an adorable card and an awesome blog! I am now a follower and look forward to seeing many more of your amazing creations!